The good people at Bell's Brewery have been releasing commemorative beers in their Batch series for about 20 years. At first, when their output was modest, they might make one to mark a 500-batch milestone, but in the mid-90s they dialed back to every 1,000 batches. This year they're wrapping up the series on a nice round number: Batch 10,000. The recipe [PDF] calls for almost every malt or hop Bell's has used since it started selling beer in 1985, a nod to the homebrewing days of founder Larry Bell—with his last beer of the season, he'd try to clear his shelves of everything he hadn't run out of during the year. Batch 10,000 is made with 101 different malts and other fermentable grains—peated barley, flaked oats, red wheat, crystal rye—and 59 hop varieties, from novelties like Citra and Sorachi Ace to standbys like Chinook and Simcoe. Despite all the roasted malts on the bill, the beer doesn't pour black—it's a deep, clear ruby when held up to the light, with a half-inch ivory head that recedes to a ring. The aroma combines clean, grassy hops, young pine, and grapefruit rind with a bit of coffee, baker's chocolate, and dark toast. The taste isn't the characterless muddle you might expect given the insane number of ingredients—Batch 10,000 comes on like a black IPA, roasty and hoppy, but it's more robust and complex, hiding its 9.4 percent alcohol content well despite lacking the dense richness of a stout. I can pick out roasted walnuts, cedar resin, and the odd astringency and sweetness that fresh dates have when they're still yellow and crisp. Touches of brandy and toffee come through as the beer warms, but even at room temperature the long, cuttingly bitter finish dominates, bringing more coffee and grapefruit. 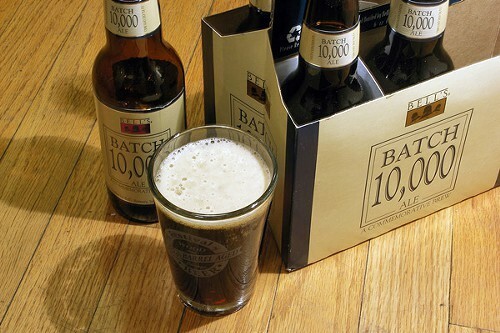 Like any sought-after limited release, Batch 10,000 is hard to get. But the Lush Wine & Spirits on Chicago had a few bottles left on Saturday, and it's available on tap if you know where to look: the Hopleaf was still pouring it last Thursday, and Twisted Spoke tapped a keg Sunday.